And sure, you can arrange it in the way you like! 1. Drain the canned fruits, keep the syrup. 2. Add water to the syrup up to 250ml. 4. Line a small cup with plastic wrap. Pour in the syrup and place some fruits. Tie it with a rubber band and hang it on a chopstick. Then place the chopstick over a big bowl so that you can keep the pouch round. 5. Make the rest and cool in the fridge for 1-2 hours until set. 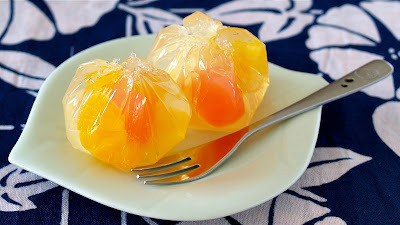 Remove the plastic wrap and serve on a dish.